White Boca is a soft shimmering fabric, that does not have the strong shine of satin. Boca is a good complement for gowns made of lace, tulle, chiffon ... everything except satin. For satin gowns, of course, choose satin shoes! How can I choose comfortable shoes? At Evening Shoes.com, we fit test our shoes to offer only the most comfortable footwear. However, not every shoe is right for every foot. 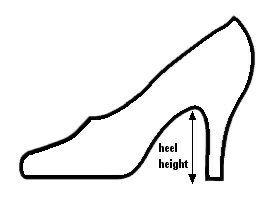 As a general rule, it's best to stay with the heel height that you usually wear in a dress shoe - it can be just as tiring wearing a very low heel as wearing a very high heel, if you are not accustomed to it. Do I have to wear stockings with my sandals? Gone are the days when the bride or party guest had to wear hosiery to complete a formal wedding outfit. All you really need is a great pair of sandals and a perfect pedicure for even the dressiest event. How can I keep from slipping in my new shoes? Take a tip from the "old shoe dogs" - just scuff up your shiny new soles with a nail file or emery board to get extra traction! Do I need to "break in" my new shoes? Happily, fabric shoes are much softer than leather and will give to the foot more easily. To ensure the most comfort, wear your new shoes for a few minutes each day a week or so before The Big Day. Help! I got my shoes dirty at my fitting! I have a question, but it's not on this list. Just click here to send an email to Liz the ShoeLady - our head stylist has helped hundreds of brides and party guests find the perfect shoes. She will respond to your queries personally within 24 hours.